Jackfruit seed| Kathal seeds| Chakkakuru| Palakottai, is the seed inside the jackfruit, which many people discard after eating jackfruit. 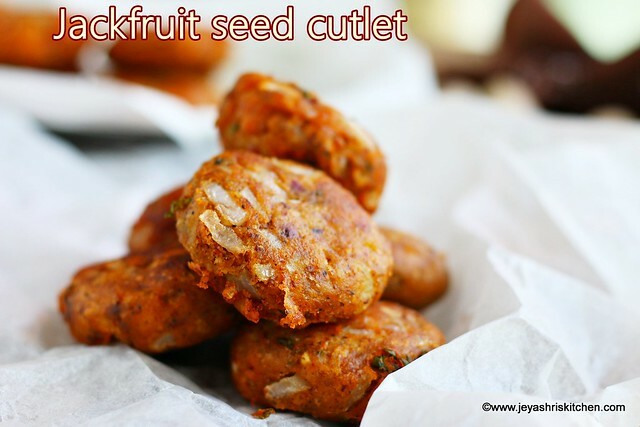 Jackfruit seed cutlet recipe with step by step pictures, made using left over palakottai. This recipe also includes how the instruction of how to remove the skin of jackfruit seed. During our childhood days, we used to get boiled jackfruit seeds in a road side shop nearby our school. I don't know how they make, but they taste so yum. Amma always scold us not to eat from there and say it is just boiled one which i can make it at home. But it will never taste the same. Sometimes amma puts the palakottai in Sambar or in kootu too. But i hate that in all other forms, the one they sell outside the school tops among all. Recently i came across this cutlet using jack fruit seeds. Here in Singapore, we get bunch of jackfruit seeds in Indian shops. I have seen this many times, but never bought them. Few days back i picked it up from Sri Murugan trading, and tried out this Jackfruit cutlet. It was a super duper hit at home and no one can make out the taste of the seeds. 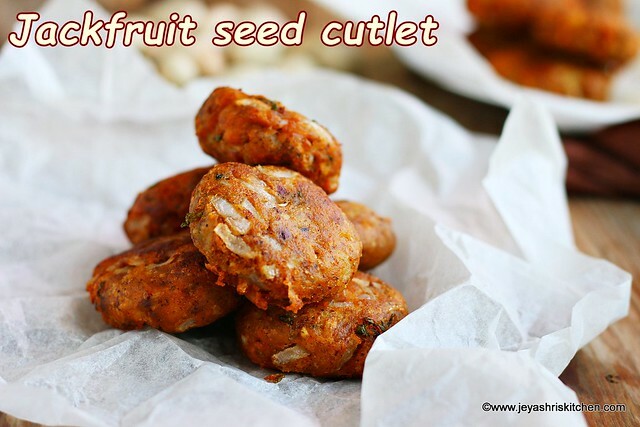 Description: Jackfruit seed cutlet recipe with step by step pictures, made using left over palakottai. *You can skip the potato, i added just to get more cutlets. Always remember it is difficult to get the skin peeled from the jackfruit seed once it is cooked. So we are going to take out the skin of the jackfruit before it is cooked. Using a heavy thing, i used my pestle, just hit the jackfruit seed. Do not hit too hard as it will break into pieces. The outer skin will break first, then it will be easy for you take the skin out from the jackfruit seed. Do it for the rest of the seeds. Wash and pressure cook for 3 whistles by adding little salt. Cook the potato also along with this in the cooker. Peel the skin and keep aside. Once done drain the water completely. Grind the cooked jack fruit seeds in a mixie without adding any water. Chop the onions and mint leaves finely. In a wide bowl add the ground jackfruit seed, onions, mint leaves and all the masala powders along with salt. Mix well and add the plain flour. Flour can be adjusted according to the consistency. We need a tight dough, the jackfruit seed itself gives a tight dough, so add accordingly. Alternatively you can use sathu maavu for a healthier version. Mix well into a tight dough consistency. Grease your hands with oil and take out a lemon sized ball of the mixture. Flatten it and keep it in a plate. Do this for the rest of the mixture. If you are not frying them immediately cover them and keep it inside the refrigerator. I fried them after 15 minutes. Heat oil in a pan and once it is hot, bring the flame to medium. 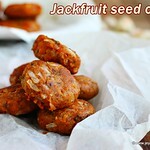 Put the jackfruit seed patties in batches and fry in a medium flame. Once done take out from the oil and drain the excess oil in the kitchen towel. Repeat this for the rest of the cutlets. I served this by wrapping them along with tortillas and some fresh veg salad. Ensure that the jack fruit seeds are drained well and cooled completely before grinding. Adding potato is optional. You can add 1/2 cup of scrambled paneer also. Coriander leaves can be replaced with mint leaves. You can dip the patties in corn flour mixture and coat them with bread crumbs as we do for other cutlets. Once done take out from the oil. Drain the excess oil in the kitchen towel.